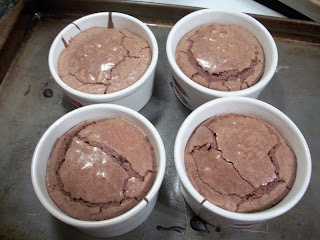 This recipe title should really be called Easy and Scrumptious Molten Chocolate Cakes because that's what they are. This is a super fast dessert - in fact it can be totally ready and served 30 minutes after you assemble your ingredients! That's freaky fast! And it's freaky delicious, and impressive - a great dessert for when you have company. The best part? You probably have all the ingredients in your cupboards at this very minute. The next best part? 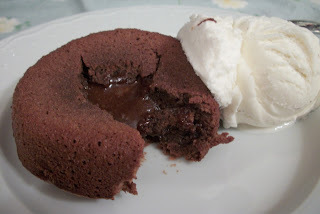 Besides the ramekins you'll bake the cakes in, this gets one pan dirty - one pan! I will be forever indebted to my friend Katie who shared the recipe with me! 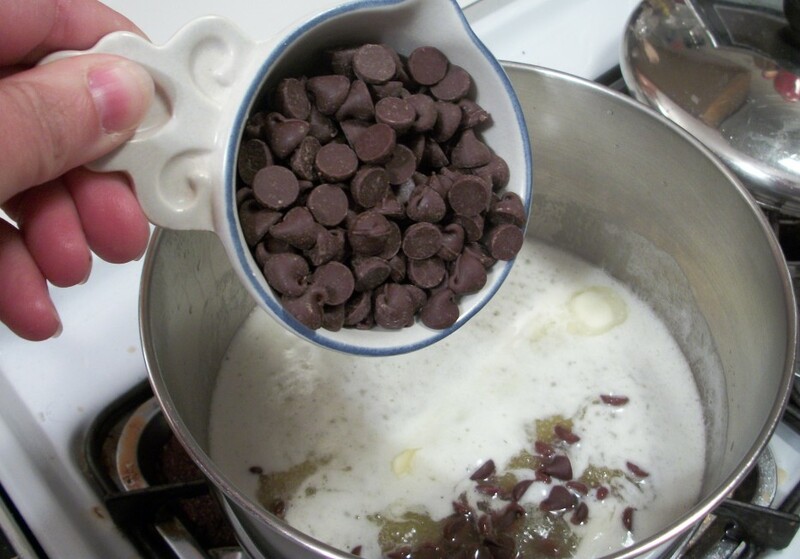 Start by melting the chocolate and butter in a medium saucepan over low heat, stirring constantly. 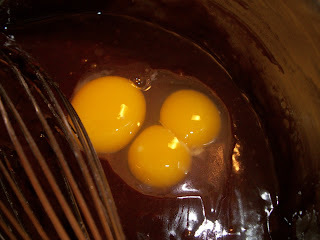 I always like to have the butter mostly melted before I add the chocolate - that way the chocolate won't burn to the pan. I used chocolate chips - you can use a higher quality chocolate if you want, but I had chips on hand and the result was very good. 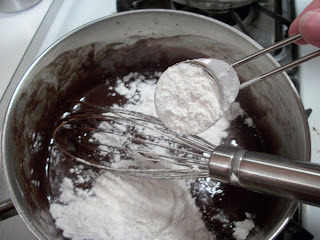 Once the chocolate is completely melted, remove from the heat and add the powdered sugar. Whisk well to get out all the lumps, then add the eggs and the egg yolks. 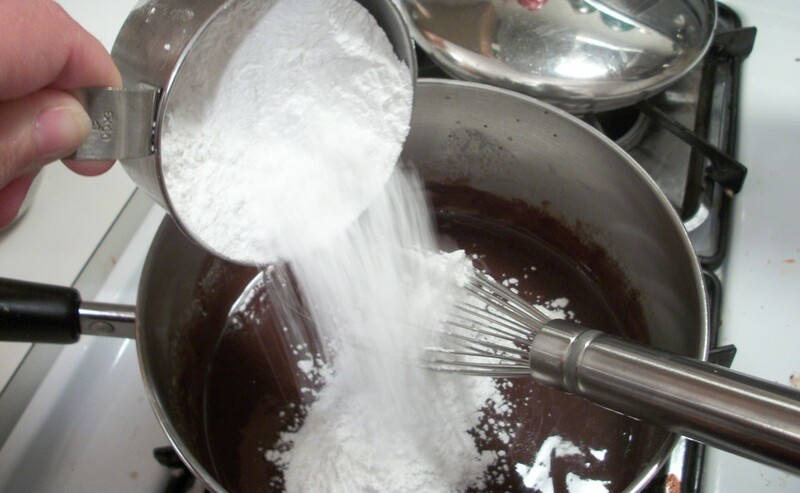 Whisk that up good, then add the flour. You've got it - whisk it up good. 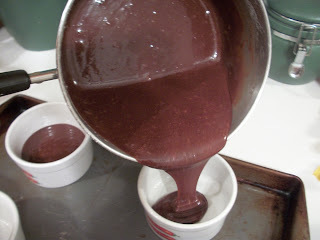 Then pour into four greased ramekins. I like to place them on a baking sheet first so they're easy to handle going in and out of the oven. Bake for 14 minutes, then remove from the oven and let them sit for one minute. then invert onto the individual serving plates. Serve with ice cream or whipped cream, and be sure to make these sound a lot more difficult when you're showered with compliments! Need more chocolate? Head on over to a Themed Baker's Sunday, Would you Like Chocolate with that? Find more goodness at the Ultimate Recipe Swap , Cooking Thursdays, Friday Food, Food on Fridays, Foodie Friday and Make a Food "e" Friend Monday. In a medium saucepan, melt chocolate and butter over low heat, stirring constantly. 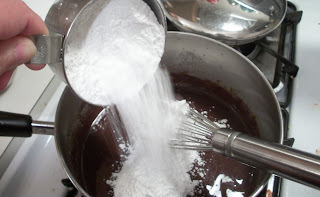 Whisk in powdered sugar, eggs, egg yolks and flour. Whisk well to incorporate all ingredients. Pour into 4 greased ramekins. Bake at 425 for 14 minutes. 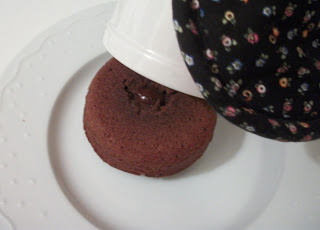 Remove from oven and let sit for 1 minute, then carefully run knife around the cake edges and invert the ramekins onto individual plates. 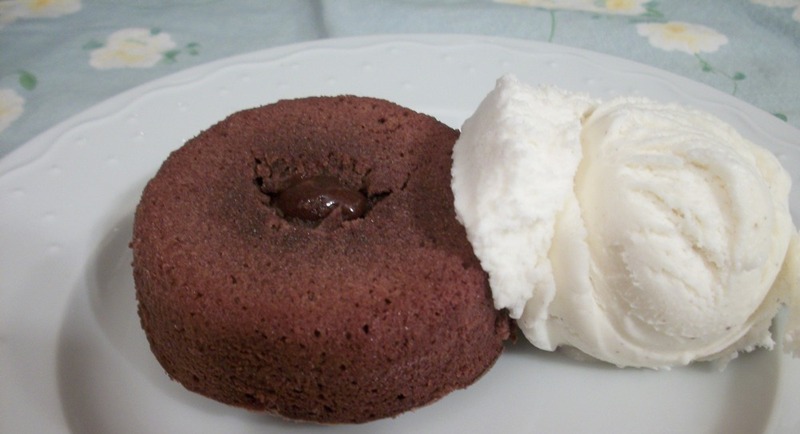 Serve with ice cream or whipped cream. Refrigerate leftovers. I love molten chocolate cakes! YUMM!!! These sounds wonderful, and better yet so easy! Oh my word, I'm drooling. What a wonderful recipe. I've seen cakes like this before but the recipes were much more complicated and time consuming! Thanks for sharing!! Now I definitely need to get me some of those ramekins! These look heavenly! 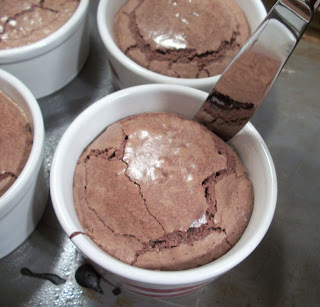 I've always wanted to make these but I have no ramekins! OH, these look so good and I LOVE anything that is also easy! Thank you so much for linking it in our Star Recipes Collection party! If you have another recipe you'd like to link-up, we have regular Make a Food-"e"-Friend Monday parties. I know it would be two in one day or you could wait until next week if you'd like. I'm going to leave you a comment on your other blog now!